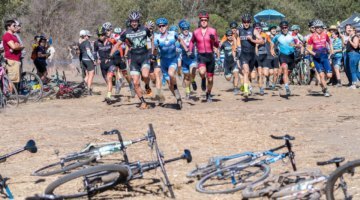 SANTA CRUZ, Calif.—The Rock Lobster Cup fundraiser cyclocross race has regenerated its claws and returns this Saturday with another attempt to grab cyclocross infamy at the beach. Another relaxing day laying out on the fine sand of Santa Cruz County. This year’s event is breaking new ground in several ways. First, it serves up the first poetic race announcement we’ve ever published. 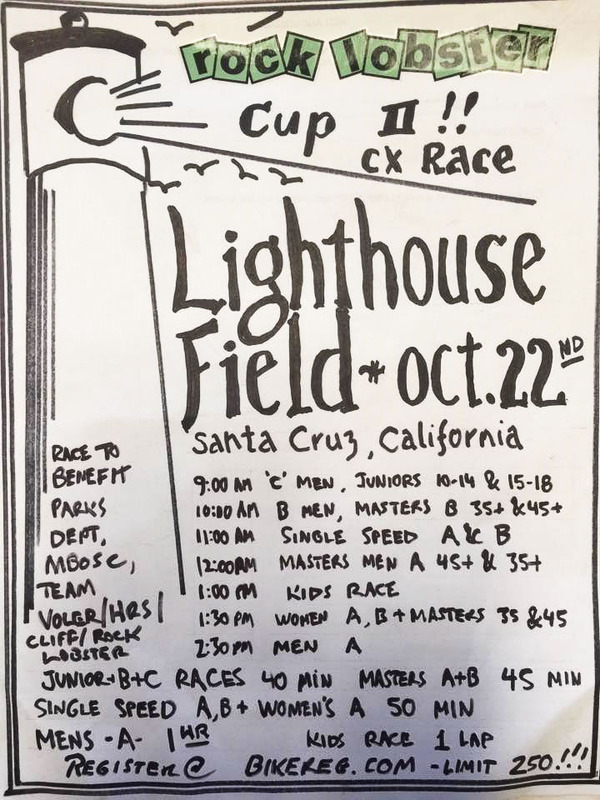 Second, it’s the first-ever cyclocross race in the shadow of Santa Cruz’s iconic lighthouse, a lobster claw’s throw from the famous Steamer Lane surfing spot. The Rock Lobster Cup returns for 2016, this time with overlooking Steamer Lane. Lastly, it’s got a field limit of just 250 spots. Which means less than two dozen unregistered readers will secure a spot in time to claw their way to victory or get shelled. See the two event announcements below. Will drum up excitement, brew great joy, cause great glee! October 22, ’cross comes to our home. You’ll be racing your bike on SC’s West Side. As the Lobster Cup II heads to Lighthouse Field! In the Bonny Doon woods at a private airstrip. To host the big shindig, right here in town. So do sign up quick. We expect to sell out! To swoop through the meadow, o’er looking the sea. But a permit’s a permit, and to that we must heed. With sixteen race classes at various times. Which on-site will cost you twenty-five hundred cents. 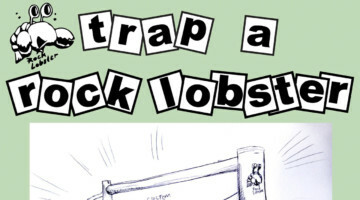 Sending Lobsters all over to help chase the dream. Cross ‘cross our fair region, there is little doubt. The venue’s top notch, ’mongst the best in the land. In Santa Cruz proper for Lobster Cup II! 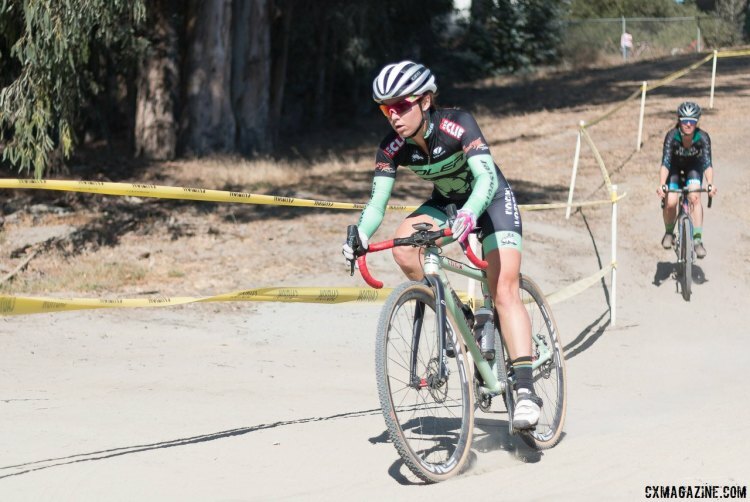 The Rock Lobster Cup II Cyclocross Race is on the calendar for Saturday, October 22. This race is presented by Clif/Voler/HRS and Rock Lobster Cycles. If you are a cyclocross racer in northern California, then hopefully you have raced at least once in Santa Cruz. If not, you owe it to yourself to hit one this season. It is hard to explain, but there great energy there. 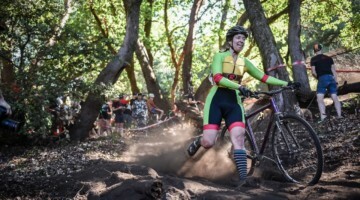 They have been racing Cross in Santa Cruz forever, way back to the days of Jungle Cross and early reign of cyclocross legend Laurence Malone, and there is a tight knit group of locals, kids to Masters, who seem to never miss a race. Awaiting you is a tough course, lots of fans, and a festive atmosphere. 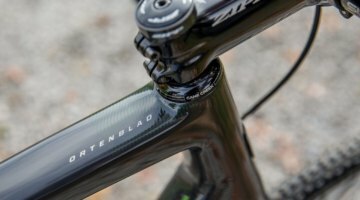 Paul Sadoff, owner and builder of Rock Lobster Cycles, has been hand crafting cyclocross frames since before you could buy one from a large company. 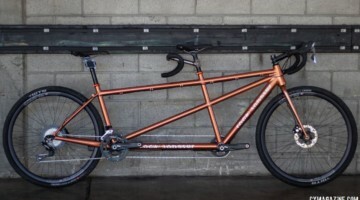 His bikes are synonymous with cyclocross in Santa Cruz. 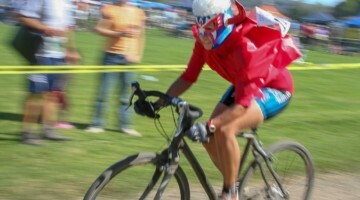 He has sponsored numerous cross racers over the years and has a worldwide following. Sadoff is putting on this race blocks from his house and across the street from the infamous surf spot, Steamer Lane, and the surfing museum. 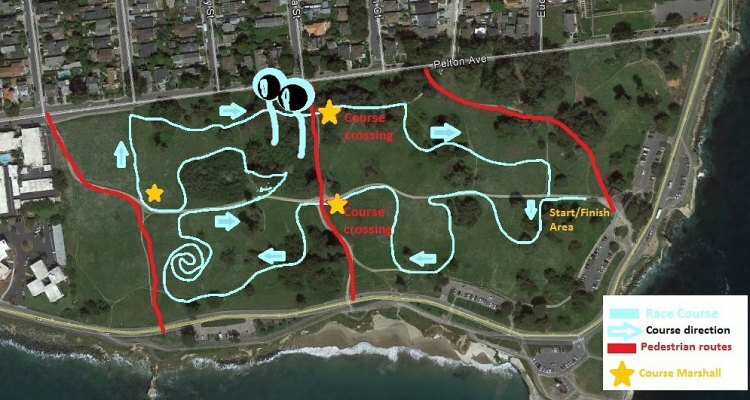 There has never been a race at Lighthouse Field State Beach Park before, and getting everything together was “like dancing on a tightrope” according to Sadoff. The Santa Cruz Parks Department realized that volunteers will be coming in to clean up before and after the race and that they could see proceeds of more than $5000. Some of the proceeds will go to Mountain Bikers of Santa Cruz. The cost is $45 for Seniors, $25 for Juniors, $25 for an extra race and there is a free Kids’ race. This is a great race to bring the whole family to as it is walking distance from Natural Bridges State Park and it’s also the season to observe thousands of Monarch butterflies resting on their southbound migration. It is also close to the Santa Cruz Beach Boardwalk and the Fishermen’s Pier (home of my favorite restaurant, Riva Fish House). It is also offseason in Santa Cruz, making hotel rates are cheaper. The race is capped at 250, and there’s currently only 20 spots left. Your first race has already started. Register on bikereg.com here. Andrew Juiliano — LOVE the poem! Cross on tomorrow!